Diamond Wheels Supplier | Eagle Superabrasives Inc.
Eagle Superabrasives is the nation’s leading supplier of high performance superabrasive supplies. We offer a complete a range of diamond wheels, cbn wheels, and cdx wheels, covering a wide range of industries. Our diamond wheels are built for high-performance, precision and clean cuts. Diamond is the hardest material known to man, occurring naturally and synthetically. Our diamond wheels are composed of polycrystalline diamonds which are synthetic, but offer the hardness and high thermal conductivity as that of natural diamond. Diamond wheels are often ranked by the hardness of the wheel. To determine the hardness of the wheel, you have to understand how the grains work. A wheel is considered soft if the grains fracture easily. Contrarily, a wheel is considered hard when the grains are limited from movement, making it more difficult to fracture. 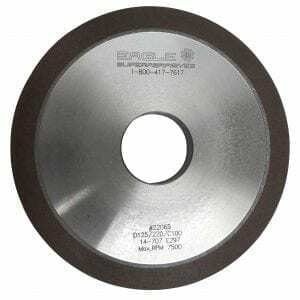 Typically surfaces that are easy to cut require a soft wheel. A harder wheel is used for a surface that needs a finer finish. We manufacture our diamond wheels as thin as 0.2mm and up to a maximum diameter of 700mm(27-½”) and anything in between. We are able to produce our wheels on six different core materials with a variety of bonds to choose from. Our advanced bonds ensure the integrity of our wheels, instilling a long work life. The bonds we use typically depend on the core that you are using, to name a few of the bonds applied to our diamond wheels: Phenolic (resin), Polyamide (resin), Vitrified, Hybrid and Metal. With an extensive inventory of over 6,000 diamond, cbn and cdx wheels in stock at our Hickory, North Carolina location, we are capable of shipping 90% of orders same day. Custom orders can be shipped in as little as seven days. When you’re ready to try the best, trust the experts at Eagle Superabrasives. We offer an unparalleled customer support and service. Our experienced staff is dedicated to providing our customers with high quality products and unequaled service. We offer experienced technical support and advice to assist you along the way.